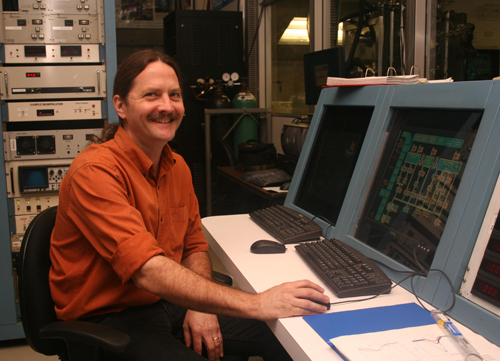 Russ Doerner, a research scientist in the UCSD Jacobs School of Enginerering's Mechanical and Aerospace Department, is using a $7 million grant to study how fusion can become an effective green energy source. San Diego, CA, Sept. 11, 2009 -- Fusion is best known for powering the sun and stars. But researchers have long been studying ways to transform that power source into future “green” energy that can be used on Earth. A team of researchers from UC San Diego, MIT and UC Berkeley have received a $7 million research grant from the U.S. Department of Energy (DOE) that could lead us one step closer to making that a reality. 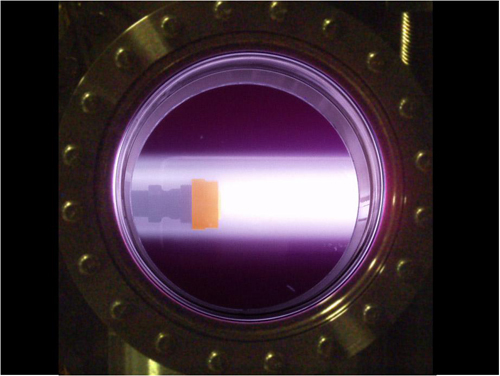 The researchers will use the five-year grant for fundamental multiscale studies of plasma-material interactions. It’s well known in the fusion scientific community that plasma-surface interactions (PSI) pose an immense scientific challenge in magnetic confinement fusion; present understanding of PSI in confinement environments is highly inadequate. Under the DOE grant, the three universities will establish science co-centers that will focus on an innovative approach to PSI sciences. The ‘wall’ Doerner is talking about is basically the first surface, or layer, between the plasma (or super hot gas) and the container it is active in. He and his team hope this research will lead to a better understanding of a way to engineer plasma “walls” to survive in the environment necessary to generate fusion power. Researchers at the UCSD Center for Energy Research and members of the PISCES team contribute widely to the research field of plasma-wall interaction science for fusion applications. At the heart of the sun, fusion takes place at a temperature of 15 million degrees. However, since it's impossible to reproduce these conditions on Earth, terrestrial fusion reactors must operate at lower pressures and higher temperatures -- at about 100 million degrees. The best way to control the plasma is to “bottle” it, enclosing the electrically charged gas in powerful magnetic fields. So far, the most successful magnetic “bottle” is a doughnut-shaped device called a tokamak, where a helical magnetic field is used to confine the plasma. A hot (1,000C) tungsten sample is exposed to high-power deuterium plasma in the PISCES-B device to investigate plasma-surface interactions. 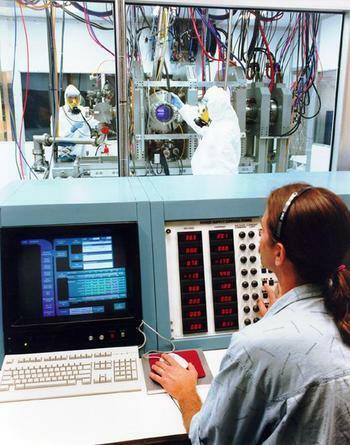 Such research and experiments are conducted at the UCSD Center for Energy Research's PISCES lab, which is used to perform fundamental and experimental research in the field of boundary plasma science for fusion applications. Whyte said the team’s goal is to also apply their future research findings for other large fusion energy and electricity-driven plants and facilities. Under the DOE contract, The ‘science centers’ at UC San Diego, MIT and UC Berkley will focus on research for surface and film dynamics, synergistic effects of radiation and plasma damage, plasma fuel retention, sheath physics and material erosion and transport.